The scientific information presented in the first three sections on the onset of fatigue during exercise (Part 1 Fatigue–Energetics, Part 2 Fatigue–Anaerobic Alactic Energy System, and Part 3 Fatigue–Anaerobic Glycolytic Energy System) pointed out the importance of beginning each discussion on energy system metabolism with basic review of adenosine triphosphate (ATP) and its role in muscle contraction. Humans have advanced through natural selection using three metabolic energy systems for all of their daily activities which may range from doing a chin-up, to walking great distances in search of water. All of the activities that require a muscle to contract or an organ to function require the ATP molecule to be in place on the protein strand. Taking this into account, then the only two variables are how quickly the ATP molecules can be re-synthesized in muscle to begin the next contraction cycle, and the waste products produced in the process. 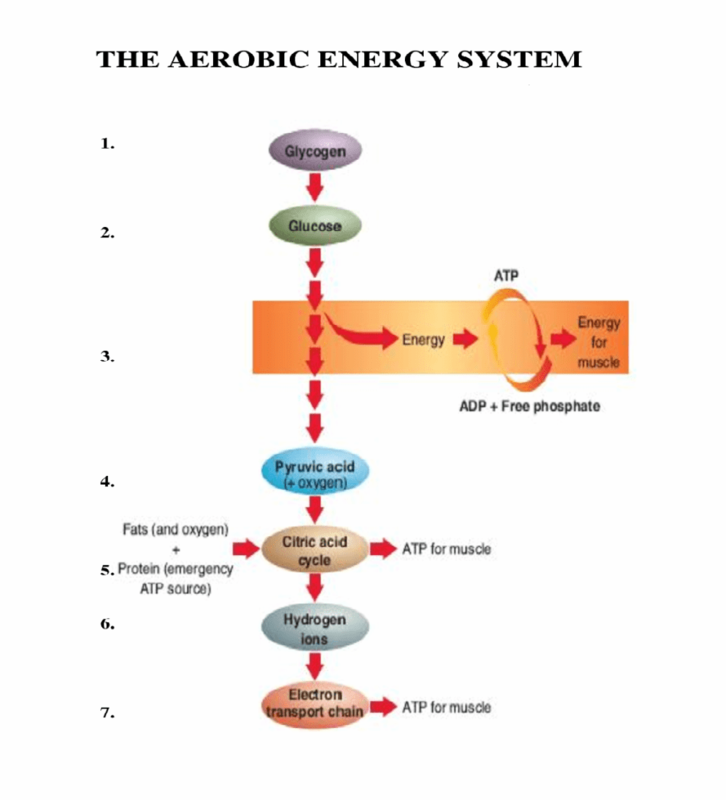 The aerobic energy system is the major source of ATP re-synthesis during most of our normal daily activities. It is also the primary energy system engine for endurance running. 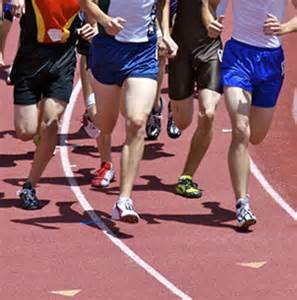 The aerobic energy system uses two substrates, either fat based molecules or carbohydrate molecules as the primary fuel. The aerobic energy release process is slower than the anaerobic process, but since endurance races and training is sub-maximal velocity in nature, much of the energy demand can be met by this system. By comparison one molecule of carbohydrate in the anaerobic glycolytic process nets 2 ATP molecules while the same molecule of carbohydrate going through the aerobic cycle nets 36 ATP molecules. In essence, much more energy is harvested, but over a longer period of time if done aerobically. The other important factor is the muscle cell’s ability to deal with the metabolic waste products. Recall that the anaerobic glycolytic energy system produces lactic acid which rapidly disassociates into lactate and hydrogen ions. Both of these molecules have been shown to cause fatigue. The aerobic energy system produces carbon dioxide and water. Neither of these substances is responsible for fatigue. How then does fatigue occur in the aerobic energy system? The answer lies in carbohydrate availability. The concept that carbohydrate availability limits prolonged exercise performance is well established. As early as 1939, scientists established that prolonged exercise performance was aligned with carbohydrate storage in the body. Basically, the limit of carbohydrate availability is about 20-22 miles of running at individual marathon pace, and that spawned the concept of “the wall” in describing the marathon. About 1/3 of the available carbohydrate is stored in the liver and about 2/3 in the inter-muscular nooks and crannies found between Type1 muscle fibers. The stored carbohydrate molecule is called glycogen. The aerobic threshold occurs at about 65-70% vVO2 max for most runners. This is the point that the body will utilize equal amounts of carbohydrate molecules and fat molecules to maintain the rate of ATP re-synthesis. In other words, if the runner moves to a faster velocity, then the percentage swings to higher carbohydrate usage. It is almost impossible to exhaust the fat stores in a human so there is no concern there. However, at the aerobic threshold, at that 65-70% percentage of vVO2 max the pace is not much faster than a jog. That pace can be used in training to complete long runs and recovery runs, but it is not applicable to the demands of any of the mainstream endurance races. By using fat and carbohydrate at about a 50/50 ratio, work can be completed that improve the infra-structure of the body, i.e. bigger left-side ventricle, greater blood volume, angiogenesis, etc, but will not deplete the carbohydrate supply to a serious degree. Thus, stored carbohydrate will be spared for more intense work done later in the microcycle. It takes about 48-72 hours to replace carbohydrate to pre-existing levels following a big depletion workout. That is why long runs and recovery runs should always be done right at the aerobic threshold. There have been studies that have shown a 2.5 times increase in stored Type 1 inter-muscular glycogen will follow a season of mostly aerobic work. Other studies have shown a five-fold increase in aerobic enzyme activity following a training season. Through targeted training the body will adapt to prolonged runs of sub-maximal exercise to delay the onset of aerobic energy system fatigue. Prolonged sub-maximal exercise is typically defined as the intensity of exercise that can be sustained for durations of 30-180 minutes. In practice, this is usually an exercise intensity of 60-85% of maximal consumption. Continuous exercise of any longer duration is probably not limited by muscle carbohydrate availability as the extent of the work at a slower rate would be more tied to fat as the primary energy source and would not stimulate improvements in carbohydrate location and availability. Coaches of middle-distance runners should prescribe at least five workouts per 12 day training microcycle that are intense enough to promote improvement in the handling and storage of carbohydrate molecules in the muscle. However, these workouts should not be so slow to mostly utilize fat, nor so fast that they deplete too much carbohydrate and retard more intense work later in the microcycle. Work done in the proper intensity zone will delay the onset of fatigue in the aerobic energy system during combined zone races.